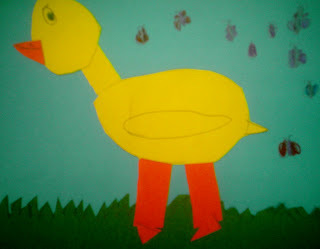 Art With Mr. E: Just Duckie! As you know...I love my job. I have the joy of developing the creative side of students, refine motor skills, instill an appreciation for the aesthetic, and aid in the creation of masterpieces. 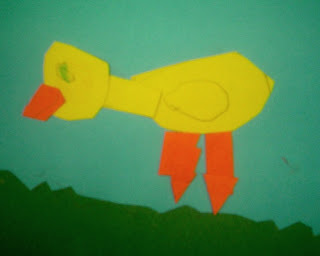 Yesterday I read to my kindergarteners, Duck On A Bike by David Shannon(the kids love this book!). Then we went back to our seats to have our first collage experience. 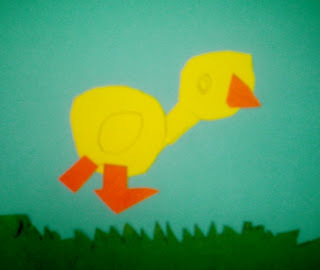 After reviewing the shapes that make up a duck, going over safety rules with scissors, instruction on how to use glue, and a quick demo...my students began to create! The 3 shown here are some of the best(I had everthing..from blank pages where they finished nothing to these lovely pieces of duckiness!!). They just make me smile!!!!!!! !